Let us turn to the night sky, where we see the zodiac signs displayed as twelve constellations set along the path of the ecliptic. The figure above shows eight of these signs. 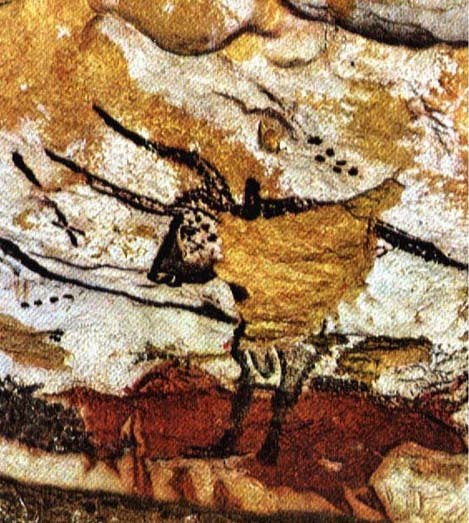 Taurus may be one of the oldest constellations, being depicted in the paleolithic cave art found in the cave of Lascaux in France where it has been radiocarbon dated at 17,000 years old. Also the Archer’s arrow indicator when projected to the Heart of the Scorpion is found to designate an important date of 13,865 B.C. This marks the time when a cosmic ray volley from the center of our Galaxy impacted our solar system, affecting the Sun, and creating a climatic warming that ultimately brought an end to the ice age; see Earth Under Fire. The western zodiac as a whole in its currently known form could have been formulated some thousands of years later. The zodiac precessional chronometer. The dates designate when the vernal equinox was conjunct the indicated ecliptic position. We find that the zodiac traditionally serves as an immense star chronometer in the heavens used to mark the passage of the Cosmic Ages. Due to the precession of the Earth’s axis, it takes approximately 26,000 years for the pole to precess through all 12 signs, a period which the ancients referred to as a Cosmic Year. The pointer on this giant clock is identified with the vernal equinox, the ecliptic direction where the sun rises on the first day of spring, when day and night are of exactly equal length. (Again, here we are reminded of the aker sphinx symbology of the Sun, and its day and night passage.) In our present era, we are said to be nearing the end of the Age of Pisces and the beginning of the Age of Aquarius. The Age of Pisces itself began almost two millennia ago, and before that was the Age of Aries, and so on. But let us move backward in time to a period when the vernal equinox was pointing to a very different position along this ecliptic clock, to the time of the Age of Leo. Leo is one of the four fixed signs that compose the astrological sphinx, the others being Taurus, Scorpio, and Aquarius. The brightest star in each of these four sphinx constellations was traditionally termed a “Royal Star” of the zodiac. They are placed at approximately 90° from one another and were regarded as being guardians of the zodiac. They included Aldeberan in Taurus, Antares in Scorpio, Regulus in Leo, and Fomalhaut in Aquarius. But, just as Leo was traditionally considered to be the king constellation of the zodiac, so too Regulus was traditionally regarded as the ruler of the Royal Stars. So, there appears to be a particular emphasis placed on Regulus. Here we note that the star Regulus, which traditionally denotes the heart of Leo, sits very close to the ecliptic as if marking a key date along this Cosmic Age chronometer. As an ecliptic marker, Regulus stands out from the other Royal Stars in that it lies closest of all to the ecliptic. It lies 0.7 degrees above the ecliptic, whereas the other three Royal Stars lie between 2 and 4.5 degrees below the ecliptic. 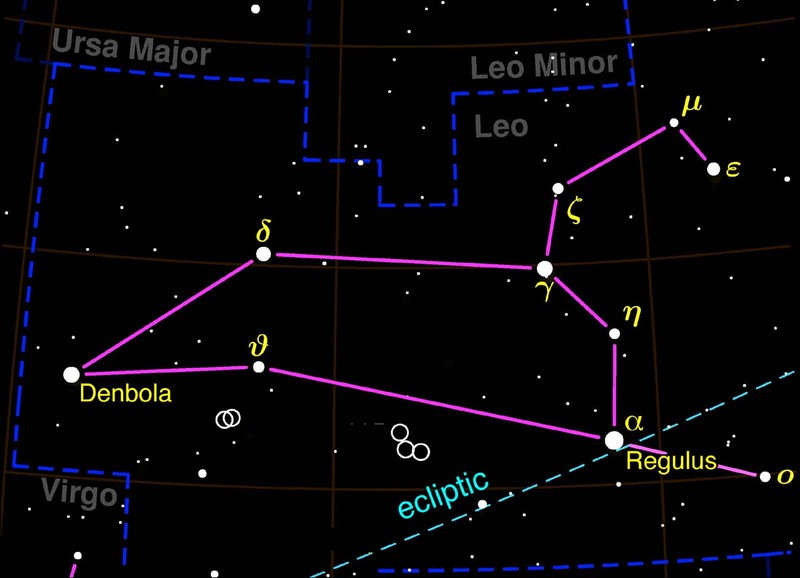 The constellation of Leo relative to the ecliptic. Leo is shown in the sky facing to the west and as the Earth’s axis precesses through its cycle the precessing vernal equinox would “rise” by passing through Regulus, through Leo’s breast, the same metaphor that is portrayed for the sun rising through the east gate of the aker sphinx. The aker is the two headed beast which in Egyptian lore was believed to serve as the doorway to the Underworld and whose two breasts served as the portals from which the Sun would rise in the morning and set in the evening. The Leo constellation also conforms to the region of the breast. Astrologers traditionally associate the zodiac signs with various human body parts and organs and also with various solar system bodies. The sign Leo in particular is associated with the heart and with the Sun. So astrology reinforces this aker metaphor of the Sun rising through the Lion’s heart, which is marked by the star Regulus. Regulus, which is situated slightly above, or north, of the ecliptic, fits well with this theme of the Sun emerging through the breast of the Sphinx into the day world. The passage of the vernal equinox through Leo, then, evokes something very positive. Like the aker gate, it implies a period in which the world was emerging out of “darkness” and into “light”. The Aker sphinx of ancient Egyptian mythology was believed to serve as the portal for the rising and setting Sun. This evokes the following question. What important past date does Regulus mark in the zodiac’s polar precession chronometer and what was its significance? We find that the vernal equinox would have been conjunct the Regulus ecliptic marker on 9,023 BC. To derive this date properly we must find the exact position of Regulus in this past era. According to the FK5 star catalog, Regulus has a low proper motion of about a 25 seconds of arc per century. Based on its current position and stated proper motion, we find its ancient position in celestial coordinates and then convert this into 1950 ecliptic coordinates. This yields an ecliptic longitude and latitude for Regulus of l = 150.546°, b = +0.711°. To find the past date when the vernal equinox would have had this same ecliptic longitude position, we use an accurate precession calculator which takes into account changes in the rate of polar precession due to the 40,000 year polar nutation cycle. For this purpose we prefer to use the equations of A. Berger. Such a calculator, which sets 1950 as its zero year date, is available on this site as a downloadable Excel file. With this calculator we find that Regulus marks the above 9023 BC vernal equinox date, which is about 11,000 years before our present time. Could this be designating the approximate date when the Sphinx was carved? Dr. Robert Schoch and John Anthony West have dated the Sphinx as being at least as old as 5000 to 7000 BC, based on the amount of weathering evident in the carved rock making up the body of the Sphinx and the quarry excavated around it. So a 9023 BC date seems plausible. Also in his book The Orion Mystery (1995), Robert Bauval presents the hypothesis that the Sphinx is contemporaneous with the beginning of the Age of Leo indicated by the time when the vernal equinox was conjunct the boundary between the constellations of Leo and Virgo. They date this at 10,500 B.C. using the assumption of a constant polar precession rate. Using a more accurate assessment of polar precession which takes into account of the nutation cycle, their date would move back to 10,700 B.C. On this date the eastward facing Sphinx would have been gazing at the constellation of Leo which at dawn would have been fully positioned above the horizon, its body reclining in a horizontal orientation. Terence Guardino agrees with this dating and suggests that the Sphinx was built to honor the Age of Leo. He proposes that it was created during the period 8100 – 10,800 BC, hence spanning our Regulus star date. But, if the Regulus star date was intended to indicate the time that the Sphinx was sculpted, this gives us an even more precise date for the Sphinx’s origin. As explained below, it makes sense that the Sphinx was sculpted close to this time, given the favorable climatic conditions that would then have prevailed. Was the Regulus symbology intended to mark the date of the creation of the Giza Sphinx and of the Temple of the Sphinx which was built from megalithic stones excavated from around the Sphinx? If so, for what purpose was it carved? Could the purpose of this construction have been to memorialize this 9000 BC date, one that was very significant to our paleo ancestors? What event occurred around this time that was so important that it should be so memorialized with the construction of a prominent monument? One possibility is that this nine millennium BC date was intended to mark the end of the ice age and the period of glacial cold that had gripped the Earth. For 60,000 years prior to that date the Earth was in a fully glaciated state, and for another 50,000 years before that the Earth was in a partially glaciated condition. 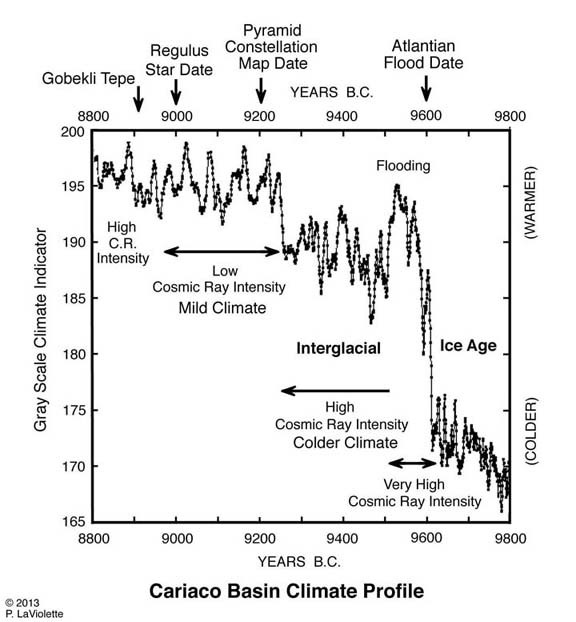 Based on climatic data from the accurately dated Cariaco Basin varve record retrieved from the coastal waters of Venezuela, we know that the last phase of the ice age, a cold period called the Younger Dryas, ended abruptly around 9,615 BC; see the climate profile shown below. This transition marks the time of a 100 year-long period of unusual warmth which caused rapid melting of the ice sheet, continental flooding, and rapid sea level rise. This flood period spans the date 9,600 BC which the priest of Sais gave to the ancient Greek ruler Solon as the time of the fabled sinking of Atlantis, and which has been passed down to us through Plato’s ancient Greek dialogue Timaeus. Here we have an example of an amazingly accurate correspondence between ancient legend and modern geological data. As I suggest in the book Earth Under Fire, the continental island of Atlantis described in Timaeus is a symbolic allegory for the North American ice sheet. Just as Atlantis island had progressively grown to continental proportions, so too this ice sheet had progressively grown to cover the entire northern sector of the American continent as well as the northern part of the Eurasian continent. The Atlantean story states that on this 9,600 BC date (nine millennia before Solon’s time) Atlantis rapidly sank into the oceans to leave behind a “shoal of mud”. This was an excellent allegory for the melting away of the ice sheet. The ice sheet was not completely gone until some millennia later. But this period marked one of its most rapid retreats. drilled off the coast of Venezuela. Important dates are designated above. This 100 year global warming transition period also coincided with an extended interval of high solar flare activity. An associated elevation in solar luminosity during this period could have been responsible for this warming and glacial melting since solar luminosity correlates positively with solar activity. So during this warm period, the Earth was consequently exposed to very high levels of solar cosmic ray radiation, making this period hazardous, not only because of the immense tsunami-like glacier waves that were issuing from the edges of the ice sheets, but also because of the lethal cosmic ray and UV radiation bombarding us from the Sun. This lethal period was followed by a 250 year period during which flooding subsided as climate relapsed into a moderate period of cooling between 9500 BC and 9250 BC. But while cosmic ray intensities had declined during this period from their former very high levels, they were still at dangerously high levels. After 9250 BC climate became warmer and solar cosmic ray levels dropped to safe levels, as indicated by the radiocarbon dendrochronology record, with the average solar cosmic ray influx remaining low until about 8950 BC. So this would have been a favorable interval during which both the Sphinx and the Great Pyramid could have been built. For almost 1700 years prior to this 9000 BC date, during its passage through Leo with the precession of the equinox, the “sunrise” vernal equinox pointer had resided beneath Leo. As seen in the zodiac ecliptic age map above, the rear part of Leo is positioned at an angle above the eclpitic. Upon transiting Regulus, this precessional clock pointer metaphorically passed through the breast of Leo and emerged into the day world as it followed a trajectory that took it above the extended paws of the Leo constellation. This is a prosaic way of depicting the Earth’s rise out of the ice age. In fact, during this climatic dark age, the solar system was congested with large amounts of cosmic dust. So, with the advent of this interval of enhanced solar activity circa 9600 BC, this material became cleared out, allowing the Sun to shine forth once again with its full brightness. As mentioned in Earth Under Fire, the ice age was brought about by a the arrival of a sequence of galactic superwaves, cosmic ray volleys originating from the Galactic center. The period of hardship at the end of the ice age climaxed with a series of super solar proton events, extinction level solar storms, that had brought about the mass extinction of the Pleistocene mammals. The largest of these occurred in 10,887 BC and 10,689 BC. Humanity too suffered greatly through this period with a substantial loss of life, as is reported in legends from around the world; see Earth Under Fire. The ending of the ice age coincided with a respite from these superwaves. Hence this was a joyous period since the Galactic storm that had for so long plagued humanity had now left our solar system. Surely if any event was worthy of being marked by a magnificent monument it would be this, and the Sphinx is indeed magnificent. 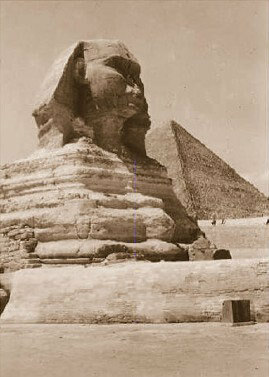 The Sphinx date may also mark the approximate time of construction of the Great Pyramid of Giza located to its south. Researcher Roger Cunningham finds that the builders of the Great Pyramid have left a star constellation map in the ceiling of the air shaft that leads upward from the Queen’s chamber toward the pyramid’s outer surface. The map appears to be engraved into the rock just above Gantenbrinck’s door, a name given to the stone plug that blocks the upper end of the air shaft and which has the remains of a copper handle embedded into the rock plug. The available photo of the shaft ceiling is a bit fuzzy since high resolution photos have not yet been released by the National Geographic Society. However, according to Cunningham the ceiling displays a map of the ancient sky as it would have been seen in 9,200 ± 400 BC. The error range reflects the uncertainty in knowing the date when the constellations would have been arranged in this fashion, based on use of a computer program to regress the constellations to their ancient positions. Cunningham concluded that the builders of the pyramid had left this map intentionally as a time capsule message marking the date of the pyramid’s construction. As we see, within the stated error range, this date matches that of the Regulus time marker. Others, such as Edgar Cayce, have suggested an older date for the pyramid’s construction circa 10,500 BC. Cayce’s date falls shortly after the time of the Great Flood whose date of 10,700 years BC. is depicted by the position of the Virgo-Leo boundary marker on the zodiac’s ecliptic-vernal equinox chronometer. This Virgo-Leo date also correlates with the two extreme solar flare proton events mentioned above dating around 10,900 BC. and 10,700 BC. Regardless of which date is more correct, ancient tradition holds that the Giza pyramid complex was built in remembrance of the many people who had died in these ancient catastrophes which had occurred during the “dark age”, of the cold ice age. If we accept the 9,000 BC/9,200 BC dates for the Sphinx and Great pyramid, the hardship filled ice age period would have come to an end just several hundred years earlier.